Travelling in Hyderabad and Chennai has had frustrating moments. Technology provides apps and services like Uber and OLA where as a group, we can rely on hailing a ride to locations at a usually low and affordable cost. But time and effort put into hailing a vehicle over a cellular device can cause too much frustration. Short fused, we usually have to resort to alternatives. Walking always provides us the option to save money, but long distances and inhaling heavy levels of air pollution rarely sounds appealing. Consistently, at every street corner, we always have one reliable fallback option— the auto. Your happy auto-driver at every corner! The auto’s popularity has a history. India and Japan first created the auto about 60 years ago (Manchanda), and it has existed as a transportation system for several developing countries since then. Today, India has 15-30 thousand auto drivers in Tier II cities (cities with a population between 1 and 4 million), and about 50 thousand drivers in Tier I cities (cities with a population greater than 4 million). Fleets of autos cover the streets. The popularity of the auto-rickshaw has grown because it provides economically efficient transportation. In total, consumers spend less than 32 cents in USD on an average ride, as a result, about 45 million auto rides in India are taken daily. The auto-rickshaw provides the best cost-efficient solution to the “First Mile Last Mile” dilemma faced in many high congestion urban environments. This dilemma occurs when commuters look for the cheapest, quickest, and most convenient mode of travelling to and from public transportation stations in order to reach their final destination. In Mumbai (a survey for an urban sustainability movement across India), 78% of riders primarily use rickshaws for commuting to and from work, and 58% of them rode 10-15 times a week. That’s a lot of rides for a lot of people just trying to get to work on time. Commuting to and from public transportation systems calls for auto rides. Autos have proven popular by providing more than just an economic and efficient form of intra-city transportation, they provide jobs too. The auto industry employs 5 million people across India. Those employed not only include drivers, but also industrial laborers as well. As of 2015, India produced 500,000 autos for domestic use, and 300,000 for exportation to countries such as Bangladesh, Egypt, Nigeria, Peru, and Sri Lanka. Increased urbanization in India grew the auto industry by two-fold between 2003 and 2010, and today the industry still grows to compete with some of the leading modern transportation service providers in today’s developing world. With the emergence of UBER and OLA, many would have thought the auto industry might not survive much longer. In actuality, autos have provided such a cost-efficient form of transportation in the Indian market that modern transportation services have hired them under contract just to stay afloat. Today OLA has 125,000 auto drivers in its fleet, and UBER only recently terminated their auto partnership at the end of 2015. These service companies have incentivized drivers to join their agencies by providing additional 10% service fares on top of routine meter rates. This avoids competition between the auto driver unions and the private industries, and it has provided a way for rickshaws to coexist in a modern transportation market. UBER and OLA have both provided competition for autos, but have resorted to methods of coexistence. In general, air pollution kills close to 1 million Indians annually , and it also poses a huge risk to human health. Airborne pollution can come in two forms, primary pollutants (harmful agents that come directly from human sources and release into the atmosphere) and secondary pollutants (non-harmful agents that react photo chemically in the atmosphere to create harmful pollutants) (WCC). Autos release soot, oil, and CO2 into the atmosphere, accounting for both forms of pollution, and consequently increase the risk for respiratory disease and acid rain in the city. As a result, efforts have been implemented to cut down on autos’ environmental risk. Smog pollution coverage over a city skyline. 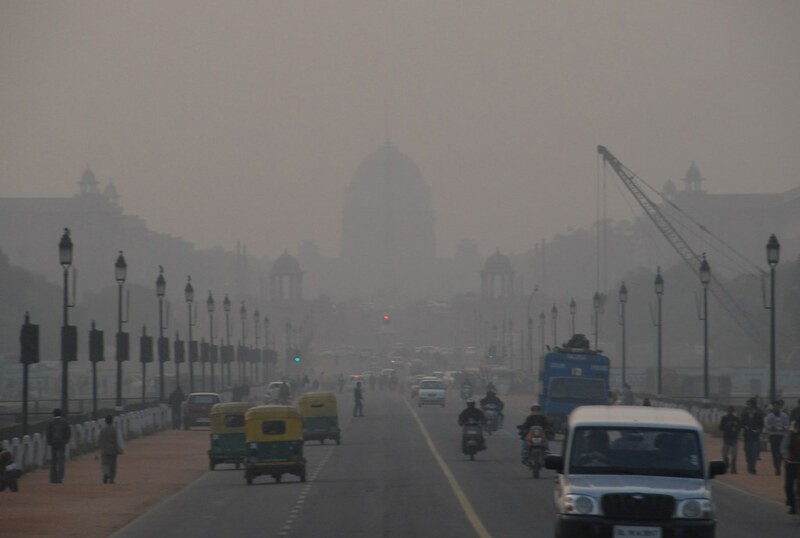 Between 1975 and 1995 India’s population just about doubled, and as a result, air pollution increased by 7.5-fold. In an effort to cut down carbon emissions, the original two stroke engine in autos was banned, and a four-stroke engine was introduced. The four-stroke engine provides a more efficient way to burn fuel, emitting 13 times less pollution, and providing 20% more fuel efficiency than the original two-stroke engine. In all, the four-stroke engine dominates the auto industry today as a safer environmental alternative that has brought many cities in India to cleaner air quality, but it remains far from satisfactory in light of India’s final goal. In 2014, Delhi exhibited the first E-rickshaw movement to provide a 100% carbon emission free alternative to the four-stroke engine. In this movement, E-rickshaws were given a free test run in order to observe how they could perform in an urban setting. Overall, the E-rickshaws provided a cheaper alternative for consumers, but also they rose safety concerns since they travelled at a considerably slower speed and caused a congestion in high traffic environments. E-rickshaws also operate on 4 batteries that need replacement after 6 months, so other concerns arose about the accessibility for drivers to find supplies in order to maintain and repair these electronic autos as well. As of 2017, Delhi has set forth an effort to completely transform its public transportation system into an entirely E-Vehicle operation by 2030. As part of their effort, the city has tried to grow the electronic motor rickshaw market by providing affordable charging stations where battery swaps can be made. Delhi has outsourced to state-run energy companies such as Indian Oil Corporation in order to set up these battery swap stations. This is one effort they have provided to growing the market for sustainable public transportation. In all, it appears the rickshaw is here to stay. As a result, the future must direct its attention to finding an affordable and efficient way to provide clean energy sources to these rickshaws so that their services can continue to offer India its most effective, inexpensive, and popular mode of transportation. Growing accessibility has appeared to have effects on expanding the market for cleaner autos thus far. But much more incentivizing must take place if this industry plans to take its first step into a “carbon free” world.